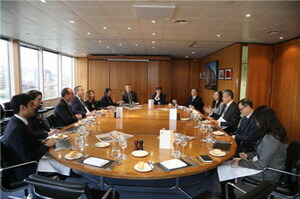 On April 4, 2019, Ambassador Liu Xiaoming held talks with senior editors and journalists of The Financial Times (FT) at its headquarter. FT Editor Lionel Barber, Deputy Editor Roula Khalaf, Editorial Director Robert Shrimsley, World News Editor Anne-Sylvaine Chassany, Opinion Editor Brooke Masters, News Editor Peter Spiegel, Big Read Editor Geoff Dyer, and Leader Writer Siddharth Venkataramakrishnan, were present. Minister Counsellor Zeng Rong, Spokesperson of the Chinese Embassy, attended the talks. Ambassador Liu briefed them on the preparations for the Second Belt and Road Forum for International Cooperation, pointing out that the Belt and Road Initiative (BRI) is an important initiative proposed by President Xi Jinping for international cooperation to enhance both China’s development and its cooperation with global partners, which is of far-reaching significance. Since its inception, the BRI has received strong endorsement and warm support from the international community. So far, a total of 124 countries and 29 international organizations have signed the BRI cooperation documents with China. Last month, during President Xi’s visit to Europe, China and Italy signed an MoU on promoting the BRI cooperation, which gave a fresh impetus to this process. Ambassador Liu noted that the BRI always adheres to the guiding principles of extensive consultation, joint development and shared benefits and follows the path of open, inclusive, benefit to all, balanced and win-win cooperation. The BRI does not have geopolitical agenda or impose deals on others on China’s term. The BRI cooperation features mutual respect and win-win outcomes. Ambassador Liu noted that China and Britain have extensive common interests and great potential in the BRI cooperation. Britain has rich experience in rule making, financial service, and dispute arbitration. In addition, China is exploring a new model for third-party cooperation under the BRI framework. He hoped that Britain would bear in mind the main trend of international cooperation and the big picture of China-UK relations, maintain its independence, objectiveness and fairness, and actively participate in the BRI cooperation, so as to create new highlights in China-UK relations. Ambassador Liu presented Xi Jinping: The Governance of China Volume I and Volume II to Barber, expressing the hope that the FT directors and editors would have a better understanding of the CPC, China and the Chinese people, reject the ideological prejudice and stereotype, and report on China’s development in a more objective and fair way, so as to help people from Britain and western countries to understand China comprehensively and deeply. Barber and his colleagues said that China is making progress with each passing day, and its influence is increasingly expanding. The FT attaches great importance to reporting on China and continues to make effort on it, including increasing the number of journalists in China. On the day of Ambassador Liu’s visit, the FT subscription exceeded one million. The FT is ready to work hard to tell the one million readers about a real China that has increasing influence on the world. The Ambassador also exchanged views with the editors and journalists on China-US, China-Europe and China-UK relations, Brexit, China-Africa cooperation, Intellectual Property Protection, Huawei, and the situation in the Korean Peninsula.